Lemon juice with some salt can remove rust stains. NEVER combine bleach with anything but water. And remember that baking soda and vinegar, while trusted standbys individually, are ineffective for cleaning if combined — and will bubble up explosively. Don’t use lemon on wood, since it can destroy protective finishes, says Sisco. Don’t overdo it with vinegar, which can dull surfaces, she says. There’s a reason that cleaning-product recipes call for adding water. With the above basics in mind, here are a few recipes recommended by the pros. Window cleaner: For clean, streak-free windows, Condon, at Better Homes & Gardens, swears by the combination of 2 cups hot water, 1 tablespoon corn starch, 1/4 cup white vinegar and 1/4 cup rubbing alcohol. “I tested a bunch of recipes, and this one is hands-down the best for mirrors and windows,” she says. All-purpose cleaner: Sisco, at Real Simple, recommends combining 2 tablespoons lemon juice, 2 cups of water and 1/2 teaspoon of castille soap, such as Dr. Bonner’s. For a stronger cleaner, she recommends mixing 1/2 cup vinegar, 1/2 cup vodka, 10 to 20 drops of essential oil and 1 1/2 cups water. to reduce waste and avoid unnecessary plastic bottles and chemicals — and to save money — many people are opting to make cleaning products from scratch at home. You can find an abundance of recipes for household cleaning products online, along with reusable glass spray bottles designed to hold them. But not all homemade cleaning products are created equal, and some simple concoctions can be downright dangerous. Baking soda and vinegar also should not be combined. Mixed together they are ineffective at cleaning and, if contained in a jar, likely to explode, she warns. So when making your own cleaning mixtures at home: Double check the safety of the combination you choose; keep all products out of reach of children or pets; and list all ingredients clearly on the jar or spray bottle. Test your cleaning mixture before using it. “Making your own window cleaner may be OK, but years of chemistry and safety research have gone into products like laundry and dishwasher detergents and furniture polishes, and you don’t want to risk accidentally damaging something that’s precious to you,” Forte says. Even so, it can be useful to know what to use in a pinch when you don’t have time to rush to the store, says Stephanie Sisco, home editor at Real Simple magazine. And many homemade cleaning combinations do work, with far fewer chemicals than in many store-bought brands. 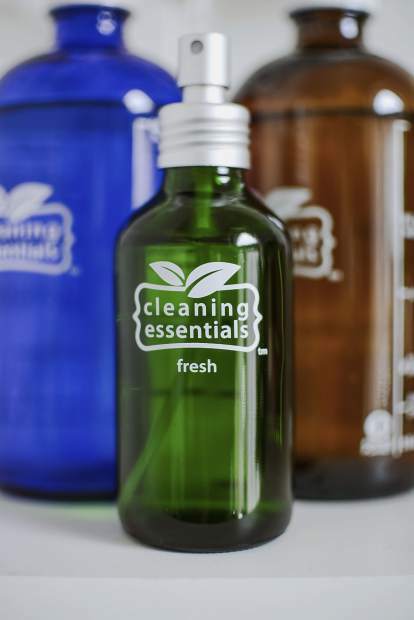 To help people make gentle cleaning products at home, Mike and Martha Robinson founded Cleaning Essentials, which sells sturdy glass bottles in various colors and sizes, labeled with recipes for solutions that can be made using mostly vinegar, water and essential oils. “Sixty years ago our grandparents wouldn’t have gone to the store for cleaners. They would have used vinegar, baking soda, some elbow grease, and been healthier for it,” Mike Robinson said.